Happy Friday everyone…I can’t even begin to tell you what a long week this has been for us. Between crisis, sports, work…Oi… This is exactly WHY I’m a bit fanatical about having something like freezer meals in the freezer at all times and have some great frozen hamburger patty recipes. You just never know when an emergency will strike or you get stuck in traffic or whatever. 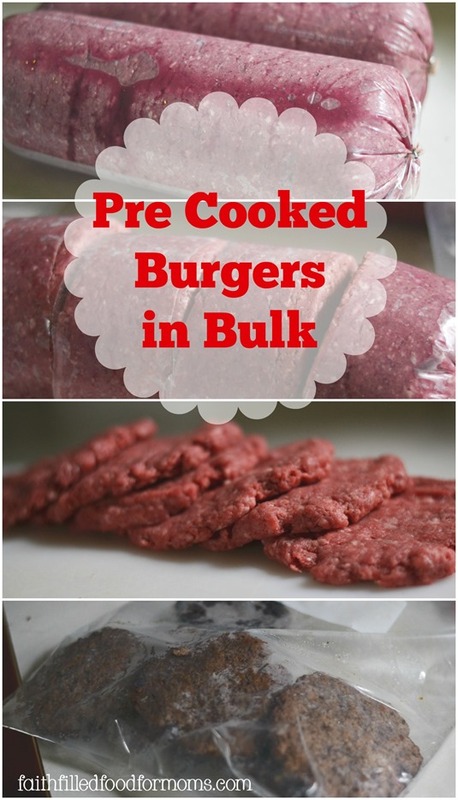 These pre cooked burgers to freeze are so easy and can be heated up in a matter of minutes on those crazy days! I know that you know I make my own homemade Hamburger Patties to freeze for later, BUT did you know that sometimes I ALSO make homemade Pre Cooked Burgers to freeze for later? Yep, just like what you can buy in the grocery store…only fresher! Now sometimes these things seem like such a no brainer, right?! But then we forget to DO it. Making homemade Pre cooked Burgers to freeze for later is a SUPER time saver and oh so deelish. Another benefit, anyone in the house can pop one of these in the microwave at anytime and have a great meal… and you don’t even need to be there to supervise! Yay! I’ve been buying in bulk for many years from Zaycon Foods (update~sadly Zaycon has gone out of business) because it is so very inexpensive and such good quality! There is nothing worse than not having the correct tools to do the work you need for cooking. 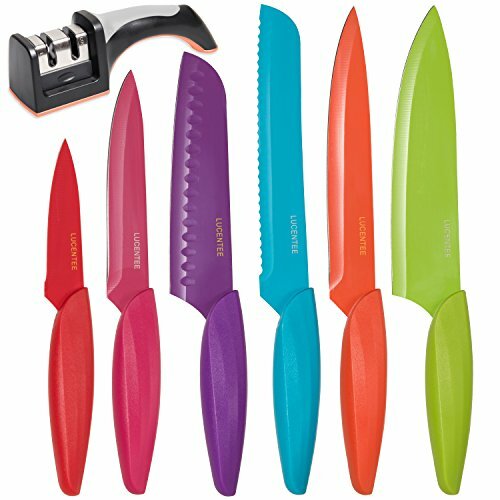 Having the right tools can make cooking SO MUCH EASIER AND ENJOYABLE! 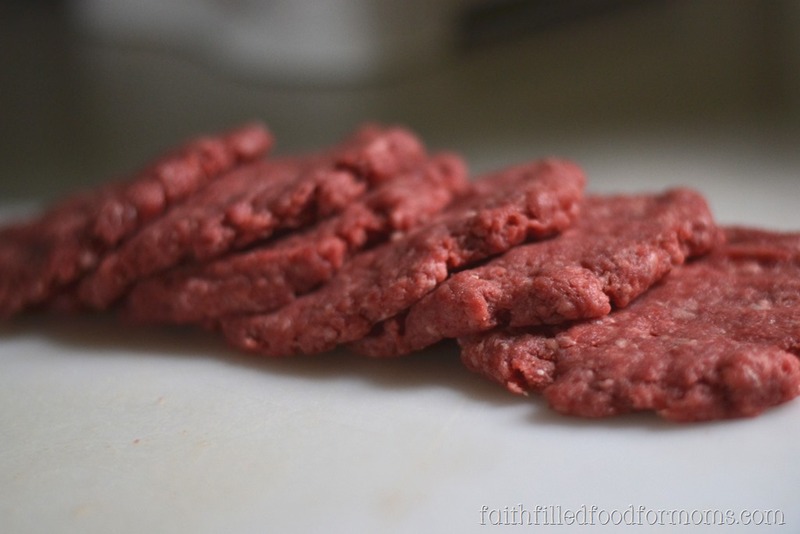 Cut some up just to freeze in large chunks or use the whole thing to make Hamburger Patties. Use some super sharp knives to make this process a breeze! Now cook until well done. You can either fry them or bake them in the oven (that’s what I do..less mess and can cook more at a time) Here’s how I cook burgers in the oven. Let them cool then place into a freezer bag for later! There you have it, homemade pre cooked burger patties for any time. Great meal ideas for kids that are on the go too! Just pop into the microwave from frozen for about 1 1/2 min..depending on your microwave. Don’t over cook since these are cooked well. 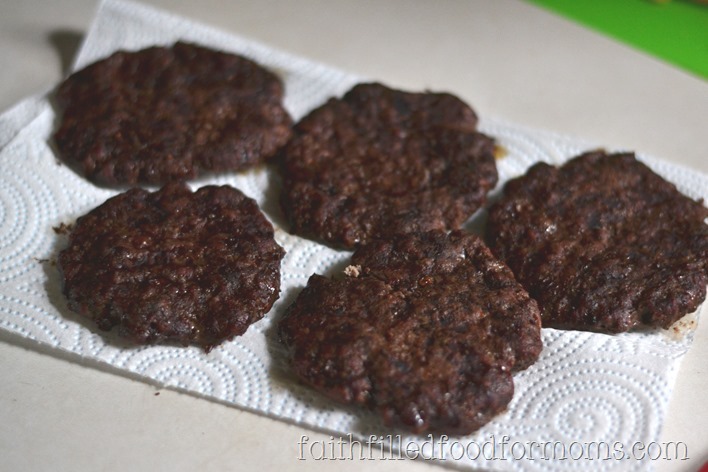 Interested in what else you can make with these pre cooked burger patties? 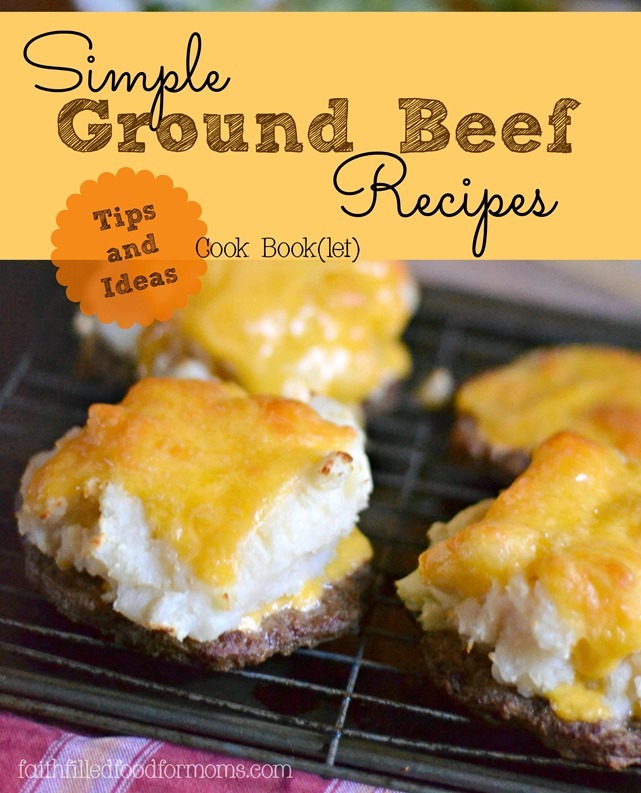 Check out my simple Cook Book (let) for Ground Beef Recipes! Linking up at these awesome party’s! 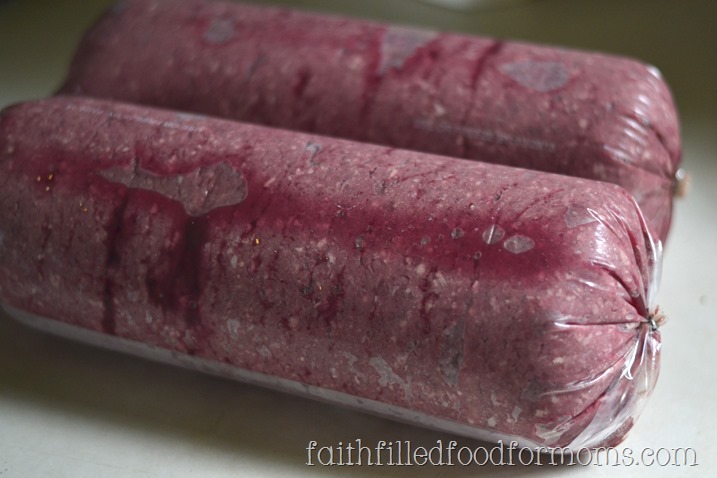 Great tip – I never thought to freeze burgers pre-cooked, but they would be an easy snack for my teenager… especially when I buy that huge pack of buns at Costco, and have lots left to use up! Visiting today from Motivational Monday. Love this idea! Don’t know why I never thought of it but I agree, you just never know sometimes how your day is going to go! Very cool idea! I think my son would be super stoked if he could just micro a burger for himself whenever he wanted. Great post! I do mine on the grill then freeze. fresh grill taste any time without the hassle of getting the grill going for just one or two burgers! Yum yum yum Rita! We do this too sometimes..so great to have grilled burger without the mess isn’t it!? Thank you for stopping by! Why in the world would you ever cook a burger to well done, ESPECIALLY when you plan on freezing it and cooking it again? Those must be the driest hockey pucks ever. Also per your photo it seems you put hot burgers into a plastic freezer bag. 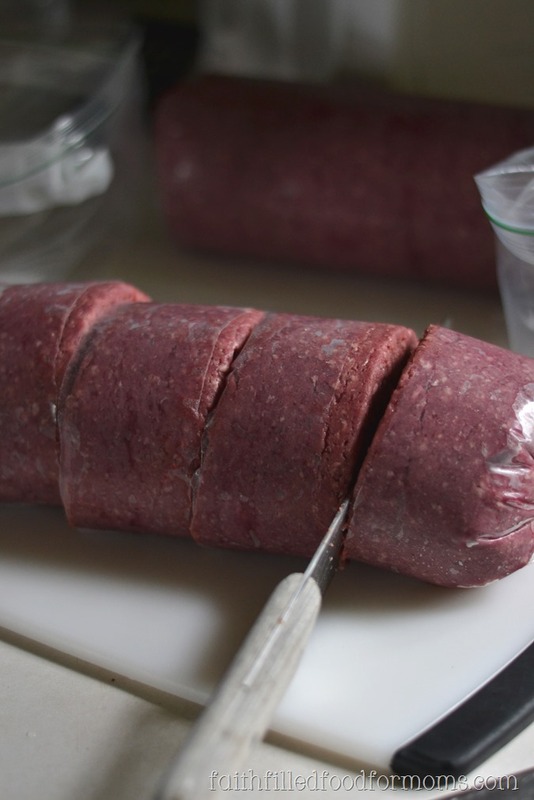 Hot meat creates steam, and when you freeze the bag it will be filled with ice. This whole idea is yuck. Well Hi there Mfg! 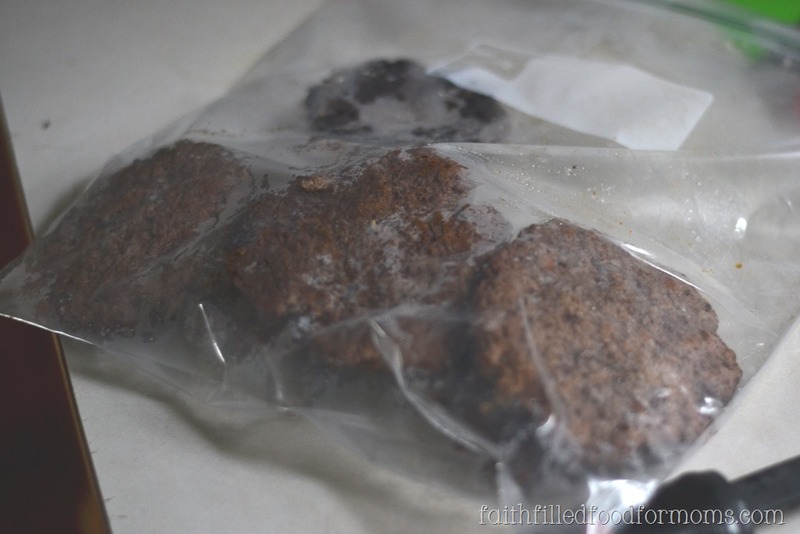 Although the burgers look dark..it was the lighting… they aren’t as dry as it may seem. If you read the post..they are meant to be able to zap for a short minute in the microwave. Not for cooking for another 15 min. This is for those that need to save time in the kitchen and for those that have kids that may need to fix their own meal. Also…I ALWAYS put my burgers in a plastic bag while they are WARM and allow to cool completely while I clean up. I don’t let my meat sit out until all the way cold..not healthy. There is always a LITTLE steam and they have never been ruined or covered with a mass amount of ice as you may infer. I noticed you left 2 separate comments with 2 separate emails…which leads me to believe you are a spammer. BUT in good faith I’ll allow you to have a place in the comment section because I don’t like to delete peeps just because they say things are yuck on my site. Have a blessed Sunday! Hope this clears things up!